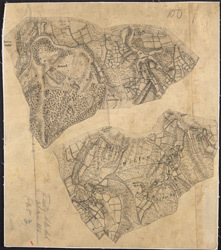 Two drawings of areas near Sevenoaks in Kent. The top drawing shows the area around Knole Park, to the southeast of Sevenoaks. Although this field sketch appears loosely drawn, closer inspection reveals it to be meticulously observed. Individual trees with tiny shadows are depicted in Knole Park. The drawing underneath is of the area around Whitley Row, which is slightly southwest of Sevenoaks.